Fell Flagship 's quite a good situational card for my matches so far. Aside from its +1/+0 buff, I usually crew it for its discard effect and I usually do it so that creature spells I cast during my turn can technically attack. I don't rely on its discard effect much though since my goal is to get creatures out as fast as possible, but in matches against control/tempo type decks, it quite helps. Yes, March of the Drowned is kinda slow for my deck, and it's only been useful for me in certain long game situations. I figured that since I can win games in 4 or 5 turns (based on my playtesting so far and with an ideal hand), I just need it to be more consistent by basically just adding more cheap creatures to my board as early as possible. 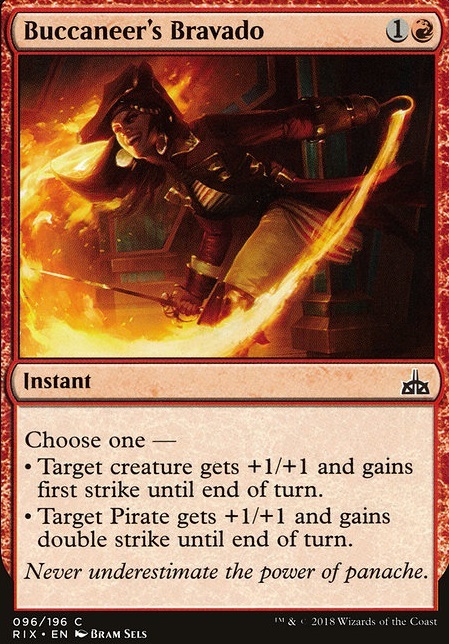 Run Amok was a card suggested (and given to me) by my friend as a replacement for Buccaneer's Bravado , and I find it to be a better combat trick in almost all situations since it gives +3/+3 AND trample while the latter only gives first/double strike with +1/+1. In my recent playtests I realized that trample fits my game more especially in dealing with chump-blockers, given that getting damage through as quickly as possible is the deck's goal. Kodiak509 on All Types of Pirates!!! First off, I want to thank you for checking out the deck, and also for your very kind words and suggestions. I’m glad that you were able to get something out of my card explanations — it’s always my hope that my reasonings for card choices are clear in my descriptions. Secondly, don’t worry! None of your questions and or suggestions were even remotely stupid — and indeed, you’ve raised some very valid possibilities that give me food for thought. I’ll go through your ideas below and reflect on them, and also tell you what my initial ideas for these cards were (if I had any before now). Deadeye Tracker: Pirates are a surprisingly versatile tribe, and this is its best piece of anti-graveyard tech. Against the Golgari and Arclight Phoenix lists, you are absolutely right that it would do work. 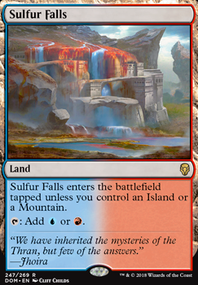 My reasons for not including it are: 1) It’s quite small and fragile, thus not really on-theme with our aggressive plan, and requires a pretty hefty mana investment to get it to a useful size for combat; 2) Since we are using a 21-land mana base, explore is far less likely to hit a land and draw it for us — not to say that makes it useless, since we can still pitch away whatever’s on top of our deck, but it also weakens some of our topdecks like Dire Fleet Poisoner, since we really don’t want our opponent to know if we have that card in hand or not; 3) We already have reasonable anti-graveyard maindeck pieces in Dire Fleet Daredevil and Lava Coil, although admittedly Deadeye Tracker is better than both of those in that particular role; and finally 4) though it’s strong against the Golgari and Arclight Phoenix decks, we’ve got strong tech in the form of Fiery Cannonade already — it kills almost all of Golgari’s creatures apart from Doom Whisperer and the Findbroker, and it kills the Phoenixes at instant speed after they come back, effectively fizzling the opponent’s spell string (but admittedly not permanently getting rid of the Phoenixes). 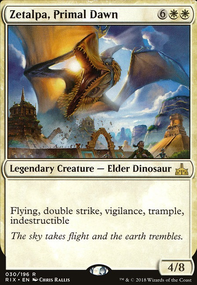 Forerunner of the Coalition: I really like this card. 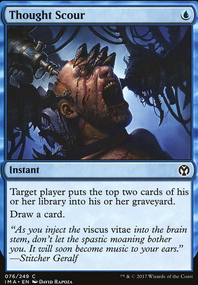 Tutoring is almost always strong, and adding unblockable damage with its triggered ability gives the deck new reach. However, it has the drawback, which you correctly recognized, of telegraphing our next play — something we’d like to avoid if possible. Additionally, its subpar size for its mana cost is problematic, coupled with the fact that it has no evasion or keywords of its own. That said, it’s far from being a bad card, and I’d probably be playing the full playset if Ruin Raider wasn’t such a strong 3-drop. Its triggered abilities are very good. Pirate's Cutlass: There is definitely a Pirate deck out there waiting to be built that will run these. It will probably utilize fast, hard-to-block creatures like the blue Pirates, and also run Buccaneer's Bravado as a finisher. At three mana, though, it’s fighting for a spot against some of our best cards, and while it is a really cool card, it’s not high-impact enough for our strategy to use. We’d usually rather spend the three mana to cast Ruin Raider and start drawing extra cards, etc. Garna, the Bloodflame: Honestly, I forgot all about this card. Sure it isn’t a Pirate...but it is supremely good anti-board sweep tech. At five mana, she’s steep and a bit fragile for her cost. Currently we are using the more-easily cast March of the Drowned as our board wipe recovery card. Garna is definitely very interesting though, and worth a look. 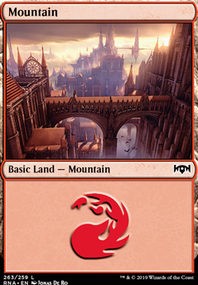 Although I’ll note that when I’m playing 21 lands, 5-drops can be pretty tough to cast. Thanks again for the comment and I hope this helped you. Feel free to get back with me if you have more thoughts! Hi Ninjew42, thanks!! I like your deck and suggestions a lot. 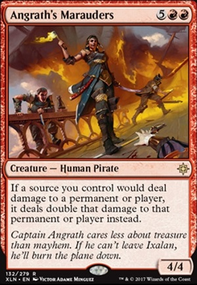 The haste on Captain Lannery Storm and Fanatical Firebrand is sweet, but I hate they don't have evasion or even pseudo-evasion. It makes turns where I can't attack with them because I don't have a trick, or enough mana open for a trick. I'll test with them and see how they go! 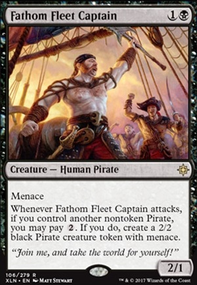 Walk the Plank is an awesome card, except that I play this on MTG:A and run into stupid, stupid, merfolk. 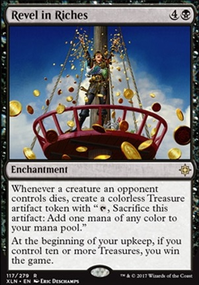 The double black mana cost is also really rough, at least until Ravnica Allegiance comes out and Blood Crypt becomes available. I like being able to keep starting hands with double Unclaimed Territory and I fear I'll never be able to play this when I need to. Lightning Strike is indeed a great candidate and potential way to finish out a game. I've played with it before to great success, but at the moment I favor Lava Coil because it can remove most troublesome blockers, like drakes or phoenixes. Vraska's Contempt is my favorite removal in the format, but it's too slow and expensive for this deck. I love exiling planeswalkers but I think this deck does better by doing damage with its pirates. 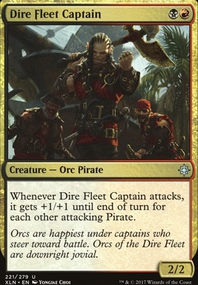 Buccaneer's Bravado and March of the Drowned are clearly awesome, but if I have multiples of them in my hand I'm usually dead in the water. How do you deal with that? Buccaneer's Bravado is the whole point of playing this deck. It's the best finisher for an aggro tribal deck that you could ask for.